Home Healthy Living Babies & Nursing To Cloth Diaper or Not To Cloth Diaper? We had a tough time deciding whether or not we would use cloth diapers. We thought they’d be expensive, that the laundry would be too much, that they’d smell or that I’d be grossed out by them, but through the debates, we kept coming back to the fact that they are just much better for the environment than disposables. I know that some people argue this point, so I’ve asked Jon to write up some of the research he has done on the environmental impact of cloth versus disposables. For now I’ll just say that at the most basic level, I balanced the environmental impact of doing more laundry versus adding to the landfills and the oil used to make most disposables, and decided to go with doing the laundry. At about $0.25 a piece for disposable, instead of piling up in the landfill, I have a little bit extra cash in my wallet. We’ve been using cloth diapers for almost six months now, and love them! We wouldn’t go back. [Update: After almost 3 years, we still love cloth diapers!] We’ve changed over 1,100 diapers and the vast majority have been reusable cloth diapers. There are situations where we use disposables, but Jon has commented that that always makes him feel guilty. Disposables versus cloth? We used disposables on our twins and we use them on our baby now when we travel, when he has a very bad diaper rash or when we don’t do the laundry soon enough. I find the disposables are a teeny tiny bit easier than the cloth. Mostly because with disposables I never have to match a liner with a cover (pocket diapers) and it’s just two velcro/sticky tabs to attach (prefolds and covers can be a little tricky). However, cloth diapers are not hard in any sense of the word. Once in a while I’ll fall back to a prefold and cover, but really, that’s not often and not actually necessary. Another drawback to cloth diapers is that they are bulkier, both under clothes and toting around in a diaper bag. Besides, babies don’t care if they need the next sized onsie. On the plus side, I never have the dilemma of “what should I do with this dirty diaper?” I always know what to do with it – stick it in my “wet bag” attached to my diaper bag. Given the environmental benefits of cloth, I’m happy to use them in most situations and happy to give advice and help. I’ve been pleasantly surprised by how many of my friends and acquaintances are using cloth. I had no idea until I started mentioning it on facebook and twitter. If you’re concerned you’ll be the only one, just ask around your social groups a little bit. You might even find some hand-me-downs or loaners to get you started. The multiple-children question: We’re really only doing it on one, but I expect that it would be no harder on 2 or 3 children. The start up costs would be higher (but less than double), because you’d need more diapers, but you would have needed to buy more disposables anyhow. From an environmental point of view, I always feel bad when I’m washing them because I never have a full washer load. If I was washing for 2 or 3 children I would still wash the diapers every 1-2 days, but my washer would have more in it each time. There’s really no folding, just a little stuffing or sorting – depending what you’re using, so you’re not adding the time consuming parts of doing laundry (folding and putting away). If you’re anywhere in the greater Boston area, go to the Diaper Lab in Somerville for a consult. They are WONDERFUL! They have intro to cloth diapering workshops regularly, that help parents get started. For example, which brands and types of diapers you should consider differ based on what is most important to you, saving money, what’s best for the environment or allergy concerns. They helped us pick out a middle-of-the-road solution. They also have an “Experiment to own” program, where you try 8 diapers and assorted accessories for a $35 “rental” fee, and then return what you don’t want and purchase what you do. I even managed to accidentally discolor some of the diapers I wasn’t enthusiastic about and they still took them back without hassle. We have gone back several times to get additional diapers and related supplies. If you’re not in the Boston area then I highly recommend that you try to find out if you have a brick and mortar store near you where you can walk in and touch and feel cloth diapers and discuss them with a professional. If not, there are many places to buy them online. I have recently been pointed to another on-line trial program at a Site called Jillian’s Drawers. She has “Changing Diapers, Changing Minds Program” that is very similar to the Diaper Lab’s program, only you don’t choose what diapers, they send you their suggested package. This program has a $10 charge. I must say that I have a lot of experience with the Diaper Lab, that I love their staff and their attitudes. I have not had any interactions with Jillian’s Drawers at all. I have purchased directly from Cotton Babies, the inventors and makers of bumGenius cloth diapers and I was happy with that experience. Timmy loves his cloth diapers! What kind of diapers? There are many kinds and styles of cloth diapers, from the original prefolds, to the brilliant pocket diapers, easiest to use all-in-ones and hybrids of cloth with disposable inserts. There are many websites devoted to cloth diapers where you can learn all about them and I’m happy to answer questions. We started with prefolds for our infant at about 2 weeks old on the advice from the Diaper Lab. He didn’t care much about the liquid wicking away and newborns grow quickly. We bought prefolds and covers and a friend lent us a pile of additional prefolds. When he was around 3 months old we did the Experiment to Own program at the Diaper Lab which allowed us to try out a bunch of different brands and sizes and another friend lent us a bunch of her older Fuzzi Bunz. Through that program we settled on 2 brands (Fuzzi Bunz and bumGenius) that we use predominantly. I rarely use prefolds anymore because he *hates* feeling the wet on him (that started around 3 months old). One stop-gap solution I use when I run out of clean “good” diapers is that I put a microfiber insert inside a prefold so that he still gets the wicking behavior of the pocket diaper even though we’re out of clean pocket diapers. I find that I like the pocket diapers the best. It wicks the wet away from his skin, and the liner can be removed to dry separately from the cover after washing (we rarely put the covers in the dryer, we usually put the liners in). I also have a set of hemp liners that I use to double the absorbancy of the diapers at night or for car trips. The hemp holds the moisture better but takes longer to wick it away, therefore put the microfiber on the inside and the hemp on the outside in the pocket. But what about going out of the house with cloth diapers? I use the cloth when I’m out during the day, I just have a “wet bag” that hangs on my diaper bag that I put the dirty diapers in. I use cloth when I go to my mothers’ house, because it’s easy to do laundry there. I use disposables when at a hotel or when he has very bad diaper rash because the diaper rash cream reduces the absorbency of cloth diapers. Also, do not use fabric softener on cloth diapers, just like towels, it reduces the absorbency over time. The sun is a great disinfectant and bleaches things. What about diaper rash? When he has mild diaper rash I use a disposable liner (feels like a thin dryer sheet) that you can put in to protect the diaper from the cream. There are others that make a diaper rash powder out of browned flour or a special cream that doesn’t hurt the cloth diapers. Be careful with “regular” diaper rash cream because it will damage the diaper and ruin its absorbency. When he has very bad diaper rash I switch to disposables. Some people find that their babies never have diaper rash anymore after switching to cloth. I didn’t find that to be the case, but my son has super-sensitive skin. So far he has had fewer diaper rashes than his older brother, who has similarly sensitive skin, but it is not conclusive. For holding the dirty diapers I have an $8 garbage can in his bedroom with a swingtop lid with a diaper bag in it. It contains the smells pretty well, I could stick a deoderizer thing on it if I wanted to, but I haven’t felt the need yet. I also have a bag on a doorknob in my living room for changing downstairs. As odd as it sounds, it is important to not have a sealed container for the diapers as the airflow actually minimizes the odor. What about a diaper service? NO WAY on the service – it’s not environmentally friendly at all, and it makes it completely not cost effective. It’s not worth it to save that little bit of time/laundry. The services use harsh chemicals, you have to use chemicals in your house and there is tons of carbon used transporting your diapers around every week. What about older children? Well, interesting that you should ask… My 5 year-old is in pull-ups. This past summer when we started the baby on cloth diapers, my husband took my older son to the Diaper Lab and let him pick out two pull-ups for himself. We only need two, because he just uses one a night and we have to do wash diapers every day or two for the baby. I wouldn’t recommend this if you *only* have an older child, because it would be quite a waste of water to wash every two to three days for two or three items. However, if you’re doing it for younger kids, throwing in the older kid diapers too is not a big deal. I have found that his diapers are stinkier and more prone to leakage than the baby, so I often find myself just putting disposable pullups on him. For the record, Jonathan was very on board with this, you might say he even pushed me into doing cloth diapers. He did ALL the laundry for the first two months to get me to do it. Now we share the work. There is so much to say, and I could do diaper reviews and talk about specific things, like stripping the diapers or shopping on-line, but I need to stop here. If you have specific questions, please post them and I’ll use those to write up some more posts on the topic. Whether it is to save some money in the long run, keep nasty chemicals away from your baby, or helping the environment, you should consider cloth diapers. Great article, Alicia! I imagine the bay area has similar resources. Doesn’t apply to me anymore with my 10YO, but I”m wondering could you apply your same research to paper towels vs. cloth (like shamwow). The tradeoff, I think, is cleanliness and being more sanitary. When I wipeup w/ a cloth towel..all the stains are on it until I wash it. What do you think? I loved my fuzzi bunz with my 1st child. We were able to reuse them with our second, and plan to do the same with #3 this summer. When I first bought them in 2007 I felt like I was in the minority for using cloth, but lately I know more and more people going that route. Diaper Lab is awesome too. Have you heard anything about soap nuts for a greener/cheaper laundry detergent? I’ve read that they work well for cloth. CHEMICAL EXPOSURE- The diapers that hold 2 cups of fluid came out when I had my second child and I immediately noticed a chemical smell that wasn’t in the other diapers. There were no studies done as it was new, but you can’t tell me that something that sits on my newborn’s skin 24/7 is not getting absorbed into their skin. I’ve never researched the chemical but can there be a link to the increase in allergies, ADD, ADHD, or Autism etc? A very small dose, over a period of 2 years, 24 hours a day, greatly increases the level of exposure. Additionally, how is the chemical affecting the environment? Liked your blog post and would be VERY interested in seeing the research Jon comes up with. Would you please keep us in mind to share it with when you’re ready? 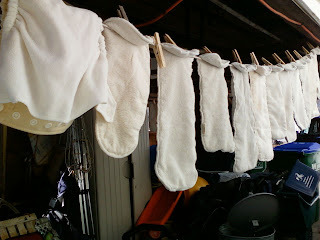 I recently saw some good research on the environmental impact of cloth diapers at http://www.nearta.com. Great article on cloth!! I love my clot diapers. We even used them when we traveled to Ethiopia. I think that they are just as easy as disposables and the environmental and financial aspects fix any and all downsides (of, which I think there are very few). And your anonymous commenter has me intrigued. I wonder if s/he is on to something. Especially when you think of the huge increase in those diseases and the increase in people who leave their babies in diapers until they are three or four. re: paper towels: That’s really worthy of a post. We believe strongly in using paper towels very sparingly, and using cloth whenever possible. We have a pile of thin blue dishrags that we use for most everything and a drying rack to let dishes drip dry. I’ll try to get that post out soon. re: soap nuts. I’m not really familiar with them, I know there are a number of people blogging on just cloth diapers and washing them, perhaps some of them know? The staff at the Diaper Lab said that the soap I use: Costco’s Kirkland laundry soap is very good for CD because it has virtually nothing in it – that’s why it’s so inexpensive. re: chemical exposure. This is definitely not our area of expertise. I had never been concerned about chemicals getting into our children, but with the number of sensitivities my youngest has, I’m just starting to research this. I’d be interested in hearing from people who know more. Heather: Thank you for the information about diaper services, I did a quick search and found http://www.changinghabits.com/ that covers the western part of MA and is environmentally friendly and has talked about expanding into other areas. You do have to factor in the fact that the diapers are being transported around, but I wonder if that balances out the fact that the diapers are used for longer by more children? It’s definitely a complicated issues, but I would think that it would be very hard to do CD if you don’t have your own washing machine – although I’m now convinced you don’t need a dryer! We dry them on a rack in the baby’s room. I’ve been cloth diapering my 3 (23 month old son and almost 13 month old twins) for about 6 or 7 months now and I love it. There are a few times that I use disposables for the reasons you mentioned, but I find myself longing to return to CD very quickly. I pretty much wash diapers daily and don’t find it that tough. I’m really happy that I am CD and wish I had done it sooner! The point of the above post is not to advocate for disposables; rather it is to point out that cloth may not be more environmentally friendly or healthy for our children. So if you like cloth, that’s fine but you are using more water and energy as a trade-off. Further, it might actually be more irritating for children according to pediatric dermatologists interviewed by consumer reports. -The best summary of the health issues is on the RDA site (see link at bottom), but in summary, some people don’t particularly like the Super Absorbent Polyment (SAP) which is used in diapers, nor some of the chemicals in the initial manufacturing/ processing. -Many people actually switch to Cloth Diapers because disposables give their children a rash; whether this is from the SAP, plastics, fragrances, or what I don’t know, but kids with sensitive skin often do better in cloth. -The point about dry skin reducing rashes is true, but many modern cloth diapers use interior fabrics with wicking properties to stay dry against the skin, so it’s not quite the same issue anymore. Also, you ought to change diapers more frequently (whether disposable or cloth), but you’re a bit more likely to do so in cloth. -Despite the fact that disposable diapers say to flush the solid material, almost nobody does, and all of that goes into the landfills, which isn’t great from a public health perspective. -2% of landfill waste is still a huge number: about 3.7 million tons per year, according to EPA data. -The energy/water trade-offs are pretty difficult to calculate between the two, and have a lot of variance depending on individual practices (top loader vs HE washer, how hot your water is, line drying vs. electric/gas dryer, etc.) and where you live (water is more scare in some areas, transportation of packaged goods is more energy intensive to rural areas). However, there aren’t any studies that I’ve seen saying cloth diapers are worse than disposables, only that they may not be much better. -Some people argue that cost can be a good proxy measurement of impact; cloth diapers are considerably cheaper than disposables, so one might infer a lower impact…haven’t thought through that argument much myself, but an interesting perspective. -Even if the calculated balance of materials/ energy isn’t a strong deciding factor, I really believe there is something to be said about embracing a mindset of “reuse” over “dispose.” The world needs a lot more of the former and a lot less of the latter, and that thinking this way is by itself of great benefit. Like a lot of choices families make with children, there are many trade-offs and personal considerations. So while I think that Cloth Diapers are better for our family and that many families would find it a better choice if the looked at it more seriously, I know that isn’t necessarily the right choice for everyone. But we hope people can have enough information about and exposure to cloth diapers to make a good decision!